1. Preheat a large skillet or wok to medium heat. Add sesame oil and heat slightly. Add white onion, McCain Peas, Corn and Carrots and fry until tender. 2. 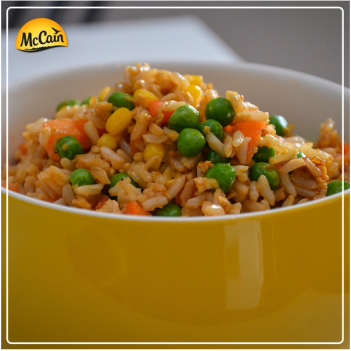 Slide the onion, McCain Peas, Corn and Carrots to one side of the wok and pour the beaten eggs onto the other side. 3. Using a spatula, scramble the eggs. Once cooked, mix the eggs through the veggies. 4. Add Combine the rice with the veggie and egg mixture. Pour the soy sauce on top. Stir and fry the rice and veggie mixture until heated through and combined. 1 Preheat a large skillet or wok to medium heat. Add sesame oil and heat slightly. Add white onion, McCain Peas, Corn and Carrots and fry until tender. 2 Slide the onion, McCain Peas, Corn and Carrots to one side of the wok and pour the beaten eggs onto the other side. 3 Using a spatula, scramble the eggs. Once cooked, mix the eggs through the veggies. 4 Add Combine the rice with the veggie and egg mixture. Pour the soy sauce on top. Stir and fry the rice and veggie mixture until heated through and combined.